Another Mech has been added to the slate of cards coming to Hearthstone in a few weeks. Cards from The Boomsday Project are being revealed every day now as the expansion release date comes ever closer. 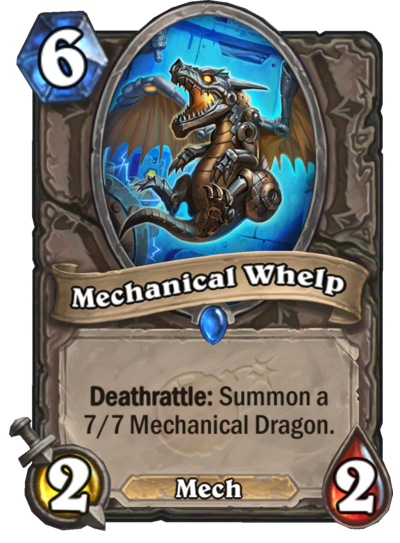 Mechanical Whelp is a six mana 2/2 Mech. When it dies, it summons a 7/7 Mechanical Dragon—that has no effect, and is likely also a Mech. This card is a slightly better version of Big-Time Racketeer from the Mean Streets of Gadgetzan expansion—a card that never saw play. Whether this is good enough or not is hard to say. Maybe in some kind of Reckless Experimenter Deathrattle deck?